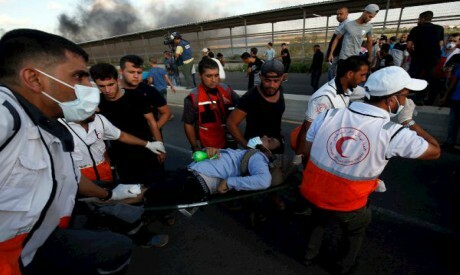 Israeli forces opened fire during a demonstration in the northern Gaza Strip near a border crossing on Tuesday, killing two Palestinian protesters and injuring 46 others, the Palestinian health ministry said. The Israeli military had no initial knowledge of any casualties or that live fire had been used, a spokeswoman said. Israel was marking the Yom Kippur fast day from dusk on Tuesday, when very few officials are available for comment. Many youths burnt tyres and hurled stones at Israeli security forces, local residents said. A doctor at Gaza's Indonesian Hospital said both men were hit by live ammunition, one in the chest and the other in the back. Three of the wounded were hit by bullets. Earlier, two other men found dead near the site of an Israeli missile strike at the coastal strip's border with Israel on Monday were identified as Palestinian cousins, family members said. The Israeli military said it had attacked a group suspected of tampering with the border fence. Israel has imposed a blockade that the World Bank says has brought Gaza's economy to crisis, leaving its 2 million people with limited access to health care, clean water and electricity. The border between Gaza and Israel has been the scene of weekly Palestinian demonstrations since March 30. At least 181 Palestinians have been killed in the protests, according to Palestinian health officials.